Questions About Roth IRAs, Savings Bonds, Mattresses, and More! 6. Are we ahead or behind? My wife and I just spent a weekend with one of our oldest friends (dating back to pre-high school days) and her husband. We see them about once or twice a year, given that we live states apart and they actually have more children than we do. It’s funny, though. When you have friends that have lasted that long, your relationship fits like a glove. You haven’t seen each other in many months, yet you sit down at a table and start talking about things as though you were just conversing yesterday. Those are the friendships you don’t want to let go of. The other “friendships,” the ones where you want to keep vague tabs on how someone is doing but you haven’t had a real conversation with them in years, aren’t real friendships any more. They ended at some point in your past and they’re really not worth much of your time and effort today. The best thing you can do is to spend your time building friendships that fit like a glove. The more of those you have in life, the better life is. Hi, I’m an avid reader of Simple Dollar and your posts specifically. I’m on my way to financial independence at a young age, but I do have many questions for you. 1) I have savings bonds from my grandparents from birthdays and Christmas’ growing up. My parents had these bonds in their possession, but have misplaced them. Is there any way I could still cash these out without having the actual savings bonds? Unless you have more information about the bonds, they’re probably not recoverable. The usual route for recovering lost or stolen savings bonds is to fill out this Treasury Department form. They ask a lot of questions about the bonds and unless they’re pretty sure that you’re describing a legitimate lost bond and they can actually find it in their records, they won’t issue you a new one. It’s worth trying, but you may not have enough info for them to verify your claim. Here’s the second of Alexis’s questions. 2) I’m getting married in a year and am super conscious of how I spend my money. I have no debt besides a mortgage in my name. My fiance is in about $80,000 of debt and I want to get this paid off before we have kids so we aren’t tied down to these loans. Do have suggestions for the best way to attack this? I have about $10,000 saved up on my own, but want a portion to go towards fixing up the house I own before more damage can be done. Is it smart to do repairs on the house with my money or just focus on paying off his student loans? It depends on what the home repairs are all about. If there’s a problem that’s actively damaging your home, then it should be repaired as quickly as possible or else the costs are going to multiply. In other words, is the cost of the home repair growing faster than the interest on the loan? If you let the home damage sit, how quickly will the cost of repairing it increase? As for spousal debt, once you are married, you should consider it just as much your own debt as your spouse’s debt because it will impact your life. Even if you try to keep things “separate,” it will reduce the amount of money that your husband can contribute to shared expenses, which reduces your collective options as a couple. I usually encourage couples to drop the notion of separate incomes and debts because, outside of serious wealth, your partner’s debt impacts you. And here’s her final question. 3) Speaking of weddings, we are trying to stay within $15,000 but still have a beautiful day in mind that we have both dreamed of. I think prices are insane for weddings, but do you have any suggestions on how to keep this to a minimum, while also getting the day we want? We have a lot of good friends and don’t want to lower the number of people we invite. Have you heard of any great ideas for inexpensive weddings? My wife and I were married several years ago for far less than $15,000. We were married in a small local church with my wife and bridesmaids wearing modestly priced gowns. Our reception was in a local community hall that we decorated ourselves, and some of my wife’s relatives gave us a “wedding gift” that centered around having those family members “cater” a meal at our reception. What do I remember from our wedding? I remember that. I remember people who were there. I don’t remember the specifics of the decoration or that we had the “perfect” DJ or “perfect” photographer or the “perfect” meal. I remember dancing with my wife. I remember talking to some unexpected guests that I hadn’t seen in many years. My suggestion to you is this: ask people you care about what they really remember about their wedding day and what they carry forward from it. Don’t skimp on the things that are repeatedly mentioned. Skimp on everything else. If you do that, you will come in below budget and have every great wedding memory that you can possibly imagine. What exactly is a “backdoor” Roth IRA? I’ve seen it mentioned on a lot of investment forums but never really seen a clear discussion of what it is. Also, why don’t you talk about it as a retirement strategy? A “backdoor” Roth IRA is simply a tax loophole that currently allows people above the income limit for a Roth IRA to contribute instead to a traditional IRA (funded with already-taxed money) and then convert that traditional IRA to a Roth IRA. The reason for doing this is so that a person who is earning more than the income level allowed to take advantage of a Roth IRA can still get into a Roth IRA because they believe it will have a long term tax advantage for them. This paper from Vanguard spells out the benefits, but it’s not all cherries and ice cream: it can sometimes end up costing you more in taxes. I tend to view the “backdoor” Roth and the “mega backdoor” Roth (which is just a variant on the “backdoor”) as tax loopholes, and I generally don’t talk about specific tax loopholes as loopholes open and close constantly. I’m far more interested in lasting principles of personal finance than whatever the loophole of the moment is. So my wife and I decided to switch to a queen bed in our bedroom. The bedframe was easy and straightforward to buy. Shopping for a mattress has been a nightmare. There are nonstop “sales” and what seems like prices that change from day to day and all kinds of crazy claims from manufacturers. I can’t find any sort of guide to what’s legitimate and what isn’t that doesn’t seem to be written by someone in the mattress industry. Where can I go to just buy a decent queen sized mattress for a reasonable price? The mattress industry is so full of misrepresentations and shady salespeople that it’s really hard to figure out what mattresses work well and what ones are junk. I tend to trust virtually nothing that I read regarding mattresses, and I don’t believe a word that a mattress salesperson tries to tell me. If you have access to your local library, check out the May 2013 issue which has a very comprehensive discussion of mattresses. The article recommends the Siemens BeautyRest as the best overall pick and the TempurPedic “memory foam” mattress. I tend to trust the Consumer Reports reviews pretty well. Your best approach is to find a model you’ve decided on and shop around for that model. In this case, I’d go to a mattress store, lay on a BeautyRest (for example) for 15 minutes, and see if you like it. If you do, shop around for one and see what the best deal you can find for it. Q6: Are we ahead or behind? My wife and I live in a pretty small apartment. We are trying to save up for a 20% down payment before buying a home and to do that we are putting aside about 30% of our take home pay each month. We think we can hit our target near the end of 2017. We have friends younger than us that have homes and are starting to have kids and so on. We’re starting to feel like are lives are “behind” them which is a weird thing to say. We know that we’re probably way ahead of them in terms of finances, but it doesn’t shake the feeling that in order to be ahead with money we are choosing to be behind in other aspects of life. Don’t worry about anyone else’s journey. Worry about your journey. Consider the journey of the people who already have a home. Likely, they either had to finance the whole thing themselves (which means they have a huge mortgage and are paying mortgage insurance to boot, which means that they have a huge debt weight around their neck) or they had financial assistance from their parents (which, likely, you can’t match). In either case, you shouldn’t be trying to do the same thing that they’re doing, because the first one puts you in a financial hole and the second one means you’re making financial decisions based on what someone else’s parents did, which is just as ludicrous as it sounds. You have a great plan. Stick with it. Don’t worry about what other people are doing, because you can’t see what’s going on in their life when their doors are closed. I don’t see how you can seriously tell someone to invest in stocks when they are at an ALL TIME HIGH. It’s like you’re begging people to put money in and watch them lose it. How pathetic. This is my response to this question, in visual form. 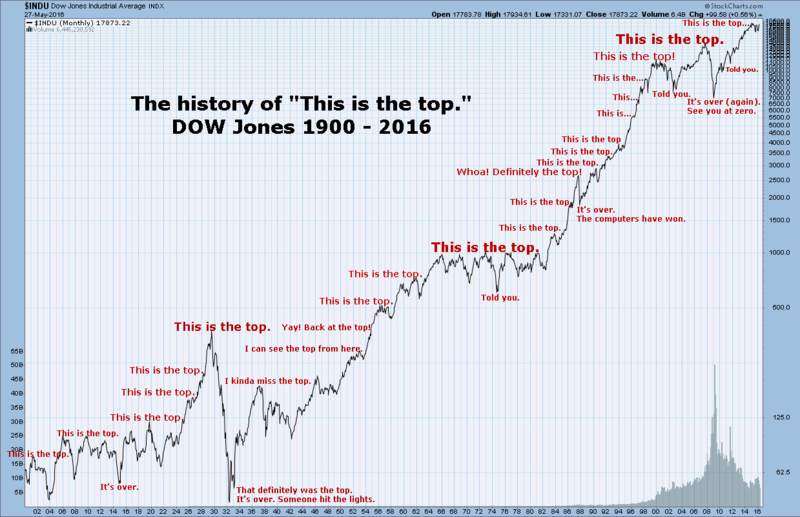 To put that into words, there hasn’t been a bad time since before 1900 to put money into the stock market. That includes all of the times when the stock market is at an all time high. Why? Worker productivity keeps going up. It has since the dawn of civilization. That’s the real secret behind all of this. A worker hired today is about twice as productive as a worker from thirty years ago. That extra productivity means more earnings per worker for the company, and that money goes into a lot of places, but one big place that it goes into is paying more dividends to the shareholders of the company. As long as that happens, a share of that company’s stock is going to keep going up and up and up. To say that the market being at an all time high is a sign not to invest is to both ignore the long term growth in worker productivity and to believe that worker productivity will never be higher than it is right now. Worker productivity has been going steadily upwards since humans were gathering berries from bushes on the banks of the Tigris and Euphrates rivers. Since then, we have become steadily more and more efficient at the tasks of everyday life and at sharing information, and there’s no reason to think that will slow down. So, shopping around for a better deal. I can get doing this on expensive items like a new car or TV or something, but how can one justify “shopping around” for the best bargain on a gallon of milk? It takes time to go to different stores and price compare each item you might buy and even if you do that for your whole grocery list you’re not saving very much and burning hours to do it. How do you decide when to comparison shop? I absolutely agree with you. Bargain hunting to save $0.50 on a gallon of milk is not really an effective use of one’s time. Time has a cost – if nothing else, you could use that time to earn more money doing something else. My strategy here is to stick with a discount grocer as my primary grocery store. We’re lucky enough to live close to a Fareway, which has stellar prices on groceries of all kinds. We do almost all of our grocery shopping there. They might not have the absolute lowest price on everything, but they’re pretty strong in terms of pricing overall and often have the lowest price on things. Plus, they’re close (no other grocery store is within fifteen minutes) and I don’t have to really think about shopping around. That saves me a lot of time, which I can use for other things in life. Just find a good discount grocer in your area that has consistently good prices and shop there all the time. Don’t worry about shopping around unless you feel like there’s a new store on the block that’s doing far better on prices. You made a really interesting comment recently about how much online media for hobbies is focused on generating purchases in that hobby and that one way to cut back on spending on that hobby or at least the desire to spend is to stop engaging in media related to that hobby. That makes sense completely. The problem is that I often use that very media to maintain friendships with people in the same hobby. My main hobby is collecting and playing generation 1-3 (Atari, NES, SMS, SNES, Genesis) video games. We have a meetup about once a month that devours a whole Saturday, but aside from that, most of my socializing with other people in the hobby comes from a handful of websites that have that very “pressure to purchase” that you mention. The good is having these connections to friends. The bad is that most of our conversations are centered around or loaded down with things to buy. Thoughts? Rather than sitting around reading about the latest purchases and chatting with friends online, actually engage in the hobby and invite people over to engage in it with you. I love boardgames. I can easily get caught up in online media and the latest reviews of those games and talking to my friends about the latest stuff. So, what I do if I get sucked into it too much and find myself desiring tons of new games is that I check out and actually play the games I have. I host some game nights. I play more games with my kids. I reorganize and clean up my collection. I play solo games. I actually participate in the hobby instead of hanging out in online forums. What happens? My desire for new stuff drops to the floor. The same thing is true for books. Rather than hanging out in online forums about the latest books, I get involved with book clubs to scratch that social itch while engaging in my hobby. I actually read books and talk about the ones I’ve read with people who have also read the same book rather than getting sucked into the hype of books I’ve not read yet. I have plenty of books to read, after all. Try as much as you can to do things rather than just buy things or hype things. For the last several years, my wife and I have maintained Google calendars and just shared them with each other so that we could see what each of us has going on, making planning meals and other things easier. We now have children that are old enough to start having activities and they also need to be able to see the calendar, too, and maybe add events. Suggestions? If they’re old enough to use an electronic device, teach them how to use their own calendar and then share it with you guys. There’s no reason not to share your own calendar back with the child, either. This is honestly what we plan to do with our own children when they reach a point of needing their own calendar tool. If they’re not old enough to be doing this, I suggest using a whiteboard. Have them jot down important events on that whiteboard, and then add every event by hand from your own calendars that they might need to know about. We’re currently in the “whiteboard” stage of things. We have a family whiteboard that lists everything of note that’s happening in the next several days. Our oldest child sometimes adds to it and, occasionally, our middle child does, too. Got any recommendations for finding/booking hotels online for a longer multi-city trip or just in general? Honestly, most of the online tools end up giving you very similar prices on things. I have not found radical price differences on online hotel or plane ticket bookings in quite a while. One site might have a couple of hotels that are lower, while another site might have lower prices on a few different hotels, but there’s nothing radically different. Instead, I’ve settled into using hotels.com for two reasons. One, their customer service has been absolutely stellar for us multiple times, including once where they basically helped us reschedule several nights of our vacation in one phone call even after the deadline for rebooking had been reached. They also helped us greatly during a family emergency. Two, we get a free night’s stay after every ten nights we book through hotels.com. Add the two together and that’s more than enough for us. In the past, I’ve used Priceline and Expedia, among others, and they’re both fine. I have no real complaints about them. We’ve just stuck with hotels.com after they were incredibly great at service during some really rough vacation emergencies. For me, service goes a long way, and they earned a faithful customer because of it. You had a really stuffed schedule in college. How did you keep it all straight w/out electronic tools? Did you use a paper planner? I kept a paper planner back in my college days and, honestly, I still would if I were in college again. It wasn’t anything fancy, but it did have a full page devoted to each day. What I almost always did that really helped is that I gave myself “homework” after the first day of class. I would go through and mark out every class session for the whole semester in my planner, along with the topic of that session and the reading assignment for the next session. Then, at the end of each session, I add any assignments to the next session (or whenever it’s due). I also used to block off about 2 hours of study/homework time for each hour of classroom time for each class. I’d often find later on that some classes needed more than that and some needed less, but 2 hours per 1 hour of classroom time was a good average. I usually plotted that out in my planner, too. I tried as hard as possible to keep my evenings open each day, so my days usually involved going to classes, then going to the library between classes to do homework and study. On weekends, I would study early in the morning (I’ve always been a morning person), so I would block off chunks of time starting as soon as I would wake up and I’d be done by mid-day. This is just what worked best for me. Your mileage may vary. I just found that treating it as much like a job as possible, with my tasks actually scheduled and my days looking as much like a workday as possible, really worked well for me. Do You Hate Your Job — or Your Boss? Be the first to comment on "Questions About Roth IRAs, Savings Bonds, Mattresses, and More!"